I’ve just returned from what I consider to be the most magical time of year to visit Disney World…Halloween time!! The fall weather is reasonably cooler than the swelter of summer in Orlando and we couldn’t complain at all about our 70 degree days spent on our recent spooktacular vacation. Many things combine together to create a spellbinding time during the month of October at Disney…and everything I see I want!! On this trip, I found some of the tastiest treats and cocktails and I can’t wait to share them with you guys along with some of my other Halloween and Fall Favorites at Disney World! This post contains affiliate links, which means I receive a small commission if you make a purchase using these links. It is at no additional cost to you, and I cross my heart I only recommend products and deals that will help you get the most out of your Disney experience. Let’s start with one of the main reasons I love going to Disney year round…the themed treats and snacks!! Most Quick-Service Restaurants, Snack Carts, and Confectionary Stands around the Disney World Property have some sort of Halloween or Fall themed treat to pick from. You’ll be able to get your poison apple fix for sure!! This year we tackled Halloween and Fall themed cocktails from Epcot, Disney Springs, and Disney’s Boardwalk. The Autumn Smash at Jock Lindsay’s Hanger Bar was a tasty delight. A yummy mixture of Captain Morgan Rum, lemon juice, peach nectar, simple syrup and a dash of cinnamon! We actually went for the poison apple glow cube and found out they were out, but our lovely waitress let us know we could get one at Abracadabar in Disney’s Boardwalk with any drink for $4. which was an Apple Cider Riesling Slushie and we also partook in the Moscato Wine Slushie because, well why not?!? Both were delicious and I can’t wait to taste the seasonal wine slushie for the Christmas Holiday season! My favorite fall cocktail was the Apple Cinnamon Sangria at Ye Sake. It was so good we went back on the last day for a second farewell cocktail! there is beautiful fall decor all over the place. which was really fun to see! So be sure to keep your eye out for fall themed decor all over the place! New for 2018 Disney Springs released this tasteful “WonderFall Flavors” Passport filled with 14 locations to visit and try delicious fall-themed flavors around Disney Springs. We were able to try several out of this passport and it also gave us great ideas for lunch and dinner options around Disney Springs! Disney releases different ones throughout the year so it’s never a bad idea to pop in and see what they may have that’s super fun during your visit. →A Full Review of the themed goodies we tried from the WonderFall Fall Flavors Passport Coming Soon!! The Epcot Food and Wine Festival is another fun fall edition that Disney World hosts August through November. Exclusive merchandise, an Eat to the Beat Live Concert, and roughly 40 Outdoor Kitchens are just a few things that make this festival a must-do. We basically eat and drink our way around the World Showcase at Epcot. We’ll ride our favorite attractions like Soarin’ and Spaceship Earth but mostly during this festival, we try out all the unique food and wine combinations and browse through all the shops in each unique country. →A Full Review of the 2018 Epcot Food and Wine Festival Coming Soon!! but that’s not all that was our favorite! If I had to pick one thing to do above all else at this party it would be the Hocus Pocus Villain Spelltacular! Along with the Sanderson Sisters, you get to see a lot of the villains, that aren’t typically in the park, perform some of your favorites. Oogie Boogie, Dr. Falicier, Maleficent and many more show their wickedly evil side on stage and I just love, love, love it!! 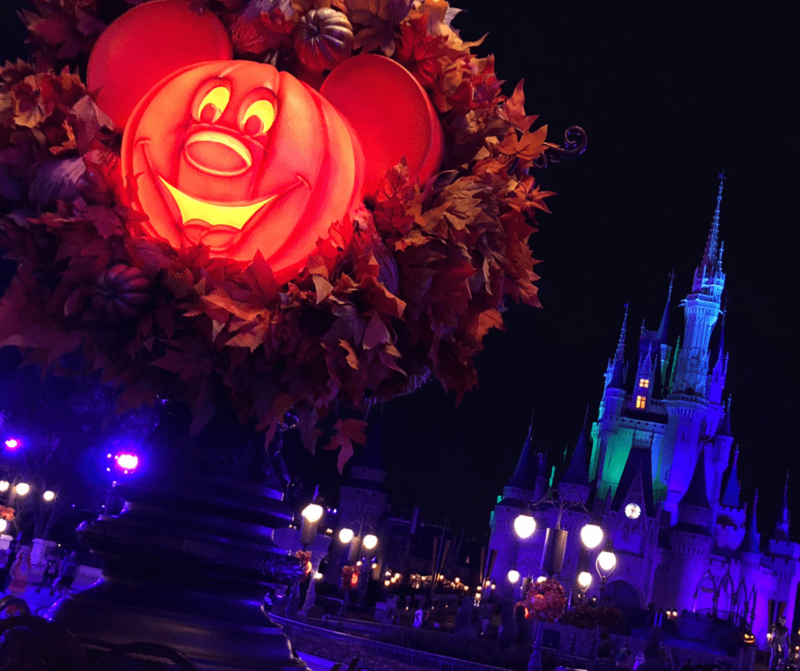 →For a Full Review of our 2018 fun at the MNSSHP Click Here. What is your Halloween and Fall Favorites at Disney World?? Do you have a must-do event or delicious Disney treat you have to pick up during the Halloween and Fall Season?? Be sure to let us know in the comments below! !